For many years Lambeg Players have worked with a variety of groups to raise funds for charity. This symbiotic relationship has raised almost £100,000 in recent years. Initially we started out helping local churches by performing plays and pantomimes in their church halls. More recently we have diversified to collaborate with other charities, some of whom are listed below. For example, we did 2 major concerts in Lisburn’s Island Centre in 2012 to support Mark Pollock. 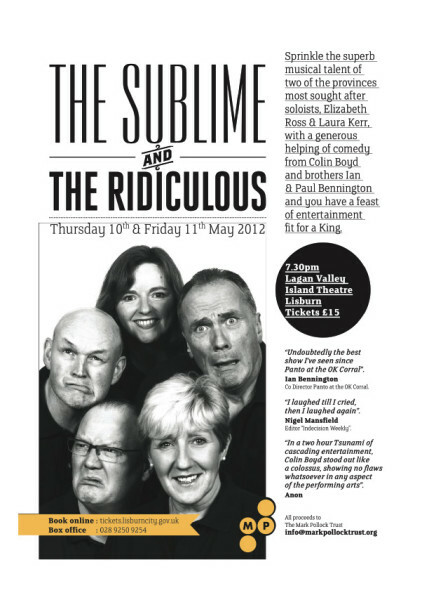 The Sublime and the Ridiculous concerts put on by members of Lambeg Players for two nights in May 2012 in Lisburn’s Lagan Valley Island Theatre raised a total of £7,500 for the Mark Pollock Trust. For over a decade Mark Pollock was known as an inspiration, an adventure athlete competing in the world’s harshest environments despite becoming completely blind at the age of 22. On the night of the 2ndof July 2010 everything changed again. He fell from a second story window fracturing his skull, some ribs and breaking his back in a number of places leaving him paralysed from the waist down. The Mark Pollock Trust was formed to raise significant funds to assist with the capital and ongoing costs specifically associated with his spinal injury – including a team of rehabilitation specialists, physiotherapy equipment, visits to specialised spinal injury activity-based recovery centres and mobility solutions. The Sublime and the Ridiculous show was put on by five entertainers, Elizabeth Ross, Laura Kerr, Colin Boyd and brothers Ian and Paul Bennington accompanied by well known Lisburn musician Geoffrey Cherry along with pianist Loreto McAuley and percussionist Jeremy Hoy. Mark Pollock has a particular place in the hearts of Lambeg Players as his mum Barbara and sister Emma are both active members and Colin Boyd is Mark’s uncle. Mark himself was involved in the Lambeg Players’ pantomimes as a youngster. Mark and his family and everyone concerned with the event would like to express their sincere gratitude to the people of Lisburn for supporting the shows and being such wonderful audiences. Traditionally after our last two evening shows of the panto we have an “orange bucket” collection for a chosen charity. In 2014 we gave the proceeds to Macmillan Cancer Support and the Palliative Care Unit at Antrim Area Hospital. In Northern Ireland Macmillan provides practical, emotional and financial support to persons suffering from cancer and their families. Every day 23 people in Northern Ireland hear the devastating news that they have cancer and 11 die from the disease. The number of people in Northern Ireland with cancer will double between 2010 and 2030 to over 110,000. No one should face cancer alone and Macmillan can be there for people with cancer, as well as their families, carers and friends. However Macmillan could not continue their good work without the continuing support, financial and otherwise, of the people of Northern Ireland. £25 pays for a Macmillan nurse to provide medical, practical and emotional support for 1 hour, £196 provides a grant to person living with cancer to heat their home when they really need to. Oasis Village Trust is a charity with a vision to transform the lives of orphans in Ndola, Zambia. 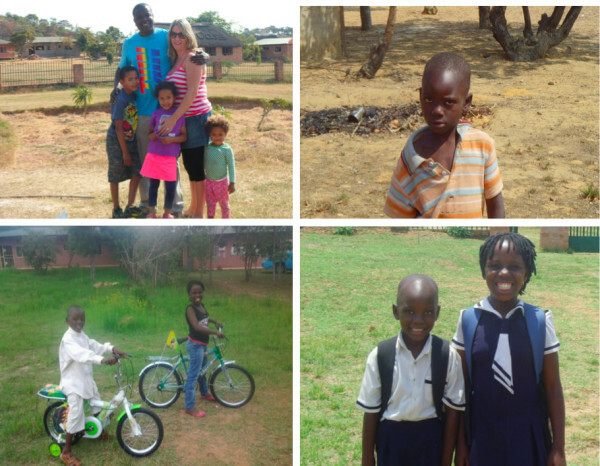 It is run by a local Belfast girl, Nicki Moyo, and her family who live in Ndola. The project started in 2007 with the purchase of a site and the initial aim is to have ten chalets which will house six orphans in each one. House mums will also be employed with preference given to widows so that in turn they can help to support their own children. We currently have eight chalets built, an ablution block, a large canteen and a jungle gym. We have also planted many fruit trees and the vision is also to set up a primary school which will be for our orphans and for children who live in the surrounding area so that this will help to bring money into the project. The last two years have been a struggle in relation to digging a bore hole to bring water into the site. This is something that is needed before the orphanage can officially open. Praise God that on our fifth attempt in November 2013 we got a vast supply of water on site and the next stage will be to get this piped into the buildings. We also have electricity on site so we are very nearly at the stage where we can officially open. It’s been a difficult and challenging project over the last few years but it has also been very rewarding. All the fundraising and hard work over the years has been worth it when we think about the lives that will be changed as a result of the orphanage. We were very blessed in September 2013 when our first two children moved in. To see the transformation in their lives over the past few months has been incredible. They were living in dire circumstances and we couldn’t sit back any longer. Their mum had died a few years earlier from aids and their dad was also sick with aids and had lost his job and they became homeless and he couldn’t look after his children so they went to live with the grandparents, but it only came to light in the Summer of 2013 that they were being treated very badly. We have given their dad a job at Oasis so he can live with his children for the time that he has left. Their lives have been transformed overnight and they are so happy. The money raised from this pantomime went to buying Elijah and Gilrina their first ever bikes, probably their first ever Christmas present, they got them on Christmas Day and were speechless. The rest of the money raised will help towards their upkeep and school fees. I am sure you can see from the photographs the change in their lives and I am so proud to be part of a vision where I can see how the money is spent and how it directly helps the people who need it most. I am so excited about the future as Oasis opens its gates to transform the lives of many orphans. I would really like to thank the Lambeg Players for partnering with Oasis over the last decade, we have enjoyed many shows and ultimately thousands of pounds has been raised to support Oasis Village and we are very thankful for the opportunity. The Lambeg Players have occasionally adopted our own charity donating directly to them. Most notable in 2005 we raised over £1200 for Scouting in Malawi and in 2006 £1300 for the Children’s Hospice.